The present condition of the Muscovite empire till the year 1699 : in two letters: the first from a gentleman, who was conversant with the Muscovite ambassador in Holland : the second from a person of quality at Vienna, concerning the lateMuscovite embassy, his present czarish Majesty; the Russian Empire; and the Great-Tartary : with the Life of the present emperour of China / by Father J. Bouvet, missionary ; by the author of the Antient and present state of Muscovy [i.e. J. Crull]. 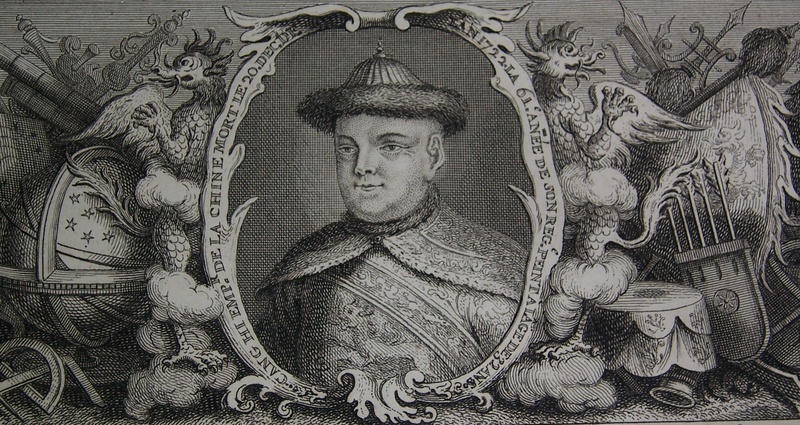 Joachim Bouvet was one of the six Jesuit mathematicians chosen by Louis XIV to go to China as his emissaries and to work as both missionaries and scientists. 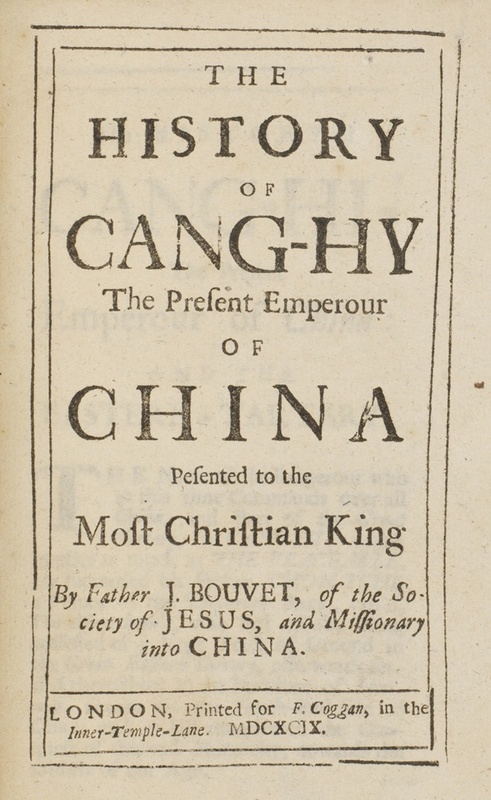 Bouvet began doing this work, especially in the fields of mathematics and astronomy in Beijing, but was then sent back in 1697 by the Emperor of China, Kangxi (1654-1722) to be his ambassador to the French King. Kangxi especially wanted Bouvet to bring back with him more missionaries who could work as scientists. Bouvet carried back a manuscript that was a description of the life of Kangxi, which sought to show the similarities between these two great kings, and essentially walk a difficult diplomatic line between his two patrons. The first, French edition was published in Paris in 1697, Portrait historique de l'empereur de la Chine, and was then quickly translated and published in other languages. The small volume from the Burns Library collection is a compendium of three works, consisting of two letters about Russia and then selections from the work about Kangxi (here rendered Canghy), which was published in London in 1699. This work has the advantage for general readers of being a contemporary English translation of an important primary communication about one of the most influential and significant of the Qing dynasty emperors. Ships travelling up the Thames brought knowledge to England’s capital and the London printers quickly circulated it near and far. Louis XIV chose six French Jesuits, including Joachim Bouvet (1656-1730), as his mathematicians. They went to Asia as missionaries as well.